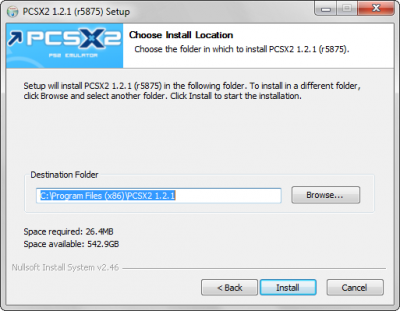 This guide explains how to download, install and properly configure PCSX2 on Windows. 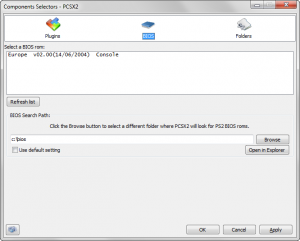 It will also give some tips on how to use PCSX2 more efficiently. Keep in mind that the guide was written for PCSX2 v1.2.1 but can still be used for other versions of the emulator. There are also Linux and Mac versions of this guide. PCSX2 is a PlayStation®2 emulator capable of running commercial games. It's an open source project that runs on Windows, Mac and Linux. Like its predecessor project PCSX (a PlayStation®One emulator), it is based on a PSEmu Pro spec plug-in architecture, separating several functions from the core emulator. PCSX2 requires a copy of the PS2 BIOS, which is not available for download from the developers, due to the copyright concerns and legal issues associated with it. You will need the BIOS files from your own PlayStation®2 console. They are not included with PCSX2 since they are copyrighted by Sony. Without them you won't be able to use the emulator at all, since PCSX2 requires these binaries to work. You'll find more information on how to dump\download the BIOS from your PS2 console later in this guide. Note that Windows XP will no longer be able to run PCSX2 compiled under modern MS Visual Studio by default (unless Windows XP is specified as a target before building). Because of the complex nature of emulation, even if you meet the recommended requirements there will be games that will NOT run at full speed due to emulation imperfection, floating point emulation differences, issues with emulator itself or other problems. You can get PCSX2 for Windows here. There are 3 versions available for download: standalone installer, Windows binaries and Orphis' dev builds. This is the default option for most users. The installer will contain the latest stable version of PCSX2. After opening it, you will be able to select the installation options. After clicking the Install button, the emulator will be installed to the chosen location. The installer will also create the following folders under the user's My Documents folder (Those folders can be changed to a different location anytime you want. See Folders section of this guide for more information). bios: This is where you should place your BIOS files. By default PCSX2 will look for BIOS in this folder. cheats: Cheats will be stored and read from here. Cheats are the files with .pnach extension. inis: This folder is responsible to store emulator's configuration files. You can tell PSCX2 to load different configuration files for different games by creating a shortcut for pcsx2.exe with certain command line arguments. logs: Emulator logs are going to be stored here. snaps: Screenshots are stored into this folder (use F8 to take a screenshot in game). sstates: Savestates are stored here. Remember that savestates made with a certain version of PSCX2 won't be compatible with other versions of the emulator. 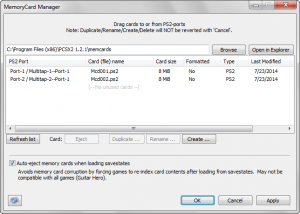 Save your game's progress on your memory card before updating PCSX2!. This option is recommended for advanced users. You will download the archive containing the Windows binaries. You should then unpack it in a desired location and run pscx2.exe. Start menu entries or a desktop shortcut will not be created automatically. This is the ideal solution if you want to keep the application portable. You will need 7-Zip to decompress the files and the Visual Studio 2013 redistributable package for this version to work. On its first run the emulator is going to create the previously mentioned folders. 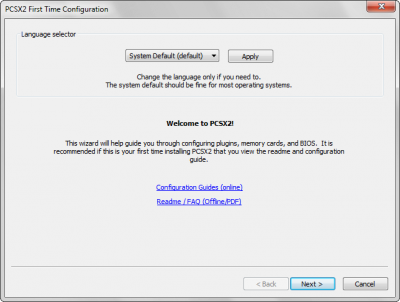 PCSX2 has the first run configuration wizard to help you with configuration. The emulator will automatically store all settings, memcards and any new configuration related files in your My Documents folder if you used the installer, or in the same folder where pcsx2.exe is located if you downloaded the binary version. The first option is the language your wizard and later PCSX2 will be using. You will be able to change language anytime from PCSX2 main menu. In the next screen you will be able change the plugins you want to use. The plugins selected by default are the most compatible ones and will usually perform better. Do not change anything here if you are not yet familiar with PCSX2. You can also specify a different folder for your plugins if you want, by unchecking the use default setting checkbox and selecting a folder of your choice by clicking Browse. Open in Explorer button will simply open a file explorer window in the folder you have specified. In the third screen, you will be prompted to select one of your BIOS images from the list. If you can't see anything in this list, you need to either copy your BIOS files in the folder shown below, or change that folder to point to a location where BIOS images are saved. For more information about the BIOS, check the BIOS configuration section of this guide. 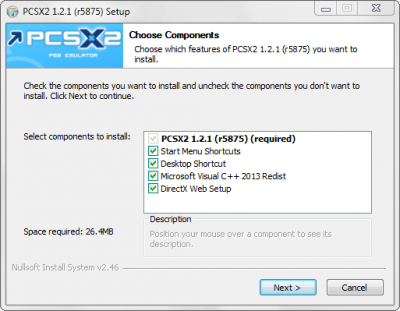 Note that you will not be able to use PCSX2 without a proper BIOS image. 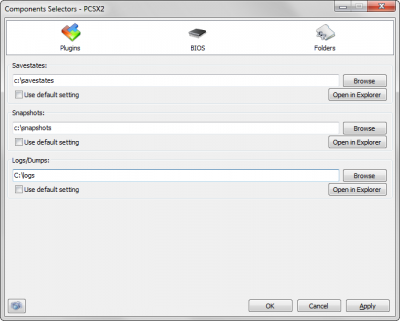 From Config menu using Plugin/BIOS item, you can review and change the above settings or plugins used by PCSX2 at any time. More information about plugins will be given in the following section of the guide. The Component Selector is the plugin and BIOS configuration window that opens when you select 'Config => Plugins/Bios. It has 3 tabs -- Plugins, BIOS and Folders. PCSX2 is a plugin oriented program. Your pcsx2.exe is the main processor that can emulate the real PS2 on the PC but it does not work alone. It needs a graphics plugin to display the game graphics and a sound plugin to play the game sounds and music, and it also needs a pad plugin to allow you to play using your keyboard, mouse or gamepad. Moreover there may be more than one plugin of each type so you can choose the one which is better suited for a particular game. All plugins are stored (by default) in the plugins folder of your main PCSX2 folder. Some plugins like GSdx for example can be updated quite often so you may want update only a chosen plugin from time to time. In order to do it you'll need to download the updated version and extract it by using the archiver into your plugins folder. Selecting your new plugin and changing its configuration may also be required. Warning: If you select a plugin you will not be able to configure it until you press apply button! The plugin configuration page will look like this (see the picture on the left). GS plugins are used by PCSX2 to provide the graphical output on the screen (i.e. to render the picture). Before choosing the plugin you will need to know if your video card is pixel shaders 2.0 capable (only the very old cards before Radeon 9xxx series or the Geforce 5xxx series does not support this standard). GSdx v0.1.16 is a DirectX 9 and DirectX 10/11 plugin by Gabest which is the most compatible and in most instances the fastest GS plugin for PCSX2. It requires at least pixel shaders 2 and SSE2 to work and Windows Vista/7/8 with a DirectX 10 compliant graphics card for DirectX10/11 mode. ZeroGS is a very old plugin which has not been updated in years. Still a very small number of games works better with this plugin, so you have an option to try it as a last resort. GSnull is a null graphics plugin which will not output any kind of video. It is used for debugging purposes. The default PCSX2 installation has GSdx in 5 versions: SSE2, SSSE3, SSE4.1, AVX and AVX2. They are in fact the same plugin compiled using different optimization instructions sets. The new AVX and AVX2 instructions give a minor speed-up only when GSdx works in software mode. These versions will not improve the speed in hardware mode. Note to AMD users: please do NOT confuse SSE3 with SSSE3 (1 extra S) and SSE4A with SSE4.1, they are totally different and are NOT supported on AMD systems before Bulldozer/Bobcat. Please fall back to the SSE2 plugin instead in case your system has an older CPU. You can also use CPU-Z to find out your processor's supported instruction set. To use the DirectX10/11 mode, you will have to be running Windows Vista or Windows 7/8 with a DirectX10/11 compliant graphics card. As of 2014 DirectX10 and DirectX11 modes of GSdx are exactly the same in both speed and compatibility. To configure GSdx plugin press configure button. This option will allow you to select what graphics adapter GSdx will use. It is especially useful for computers which have a dedicated graphics card and an onboard graphics chip, so that user can specify the dedicated graphics card explicitly. This option allows you choose the interface through which the graphics will be rendered. "Direct3D9 (Hardware)": GSdx will use the Direct3D capabilities of your graphics card. "Direct3D10 (Hardware)" or "Direct3D11 (Hardware)" (only selectable with DX10/11 graphics card): GSdx will use Direct3D10/11 mode which is often faster and usually more compatible as well. It is recommended to use this option if your system supports it. "Direct3D9 (Software)", "Direct3D10 (Software)" or "Direct3D11 (Software)": GSdx will use its built-in software renderer which will not utilize your graphics card at all. The image will be rendered solely by your CPU. This will greatly reduce the rendering speed but unfortunately this is the most compatible mode. This option is recommended if you encounter graphics bugs with the hardware renderer. "OpenGL (hardware)": GSdx will use the OpenGL interface to render the image. Currently this mode is a slower and less compatible equivalent of the DirectX renderers but it's the only option for Linux users. "OpenGL (software)": GSdx will use the OpenGL backend in software mode. "Direct3D9 (null)", Direct3D10/11 (null)", "Null (software)" or "Null (null)": The plugin will not render anything in these modes, thus not giving any output on the screen. It's useful for debugging purposes only. This option is the set of deinterlacing techniques GSdx will use to reduce NTSC interlacing effects (screen "shaking" or other artifacts). We recommend leaving this on Auto for all but some picky games. In parentheses, you can see what kind of effect and maybe disadvantage (e.g. like the incorrect FPS readings in blend) each one of these modes have. You can cycle through the interlacing modes ingame by pressing F5. 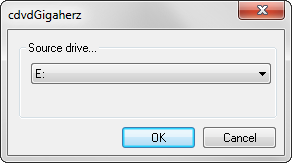 This option is only available if Hardware Renderer has been selected above. You can improve the visual quality of your games by increasing the resolution at which the textures are rendered. Please keep in mind that any non-native rendering resolution may cause various glitches in games (from very minor to more serious ones in rare cases). On the other hand for many games (especially for 3D ones) increasing internal resolution will improve the graphics dramatically. Note also that the higher resolution means more work for your video card, thus slowing down rendering process. Original PS2 Resolution - Native: GSdx will render only in internal resolution when this option is ON (that is why Custom Resolution and Scaling get grayed out). Scaling: This option will allow you to choose an arbitrary resolution (Custom Resolution). Or you can set it to 2x-6x so that the game's internal resolution will be multiplied by that value. For instance setting this option to 3x for a game with native resolution of 640x320 will render all scenes at 1920x960 (triple of the native resolution). Using scaling multiplier instead of custom resolution may prevent some upscaling bugs from manifesting. As of 2015 most graphics cards can easily render at x2 or x3 scaling but may get a sharp speed drop at higher settings. Enable Shade Boost: This option will help you to adjust saturation, brightness and contrast to your liking. Press Settings.. button to configure. The Reset button allows you to set the sliders to their initial positions. Enable FXAA: GSdx will apply the FXAA anti-aliasing algorithm to improve the visual quality of your games with a (usually) minor speed hit. You can also toggle FXAA on and off ingame by pressing PageUp. Enable FX Shader: Since version 1.2.0, PCSX2 is able to use external shaders for visual improvements and to add various special effects. By default, PCSX2 comes with 4 simple scanline shaders (which you can cycle through with F7 while ingame). For a huge set of shader effects which include UHQ FXAA, Bilinear FS Filtering, Bicubic FS Filtering, Gaussian FS Filtering, High Quality Blended Bloom, Per-Channel Gamma Correction, Scene Tone Mapping, RGB Colour Correction, S-Curve Contrast Enhancement, Texture, Sharpening, Pixel Vibrance, Post-Complement Colour Grading, Cel Shading, Scanline Emulation, Vignette and Subpixel Dithering you can download Asmodean's shader file from the PCSX2 forums. Open downloaded zip file and extract PCSX2Fx_Settings.txt and shader.fx files in the same directory pcsx2.exe is located. You can change some shaders' settings by editing the PCSX2Fx_Settings.txt (the file contains all the needed instructions). External shaders should be used with caution because some of them may potentially have an enormous impact on speed. Note that you can use external shaders even with GSdx software renderer, which is the best way to get higher visual quality in this rendering mode. You can toggle the external shaders on and off by pressing Home button while ingame. Hardware mode Settings This set of options is available only if you have selected Hardware Renderer. Here you can tune some settings for extra performance or video quality. Texture filtering: Enables linear filtering when rendering textures. Checked option will ensures filtering in all cases and grayed will only use filtering when the game calls for it. Logarithmic Z: Changes the way the third (depth) coordinate is treated (logarithmic or linear). This option should be left ON unless you experience some weirdness in the objects (like seeing through them). This options is enabled only for graphics cards that do NOT support a 32bit Z-buffer. Allow 8-bit textures: Sacrifices texture decoding speed for video card memory (RAM) requirements. In 8-bit texture mode the plugin will utilize less memory of your graphics card storing some of the textures in 8-bit format (instead of 32-bit otherwise). That may help with some games that use a lot of 8-bit textures but may become a clog for the others because these textures will then be decoded by the special shader consuming a portion of the cards processing power. Alpha Correction (FBA): (DX9 mode only) This option will make some of the textures partly transparent (when required) but may sometimes cause some slowness. Should be ON by default. Only use these settings when you are absolutely sure that they are needed for your game to function. These settings can cause serious graphical glitches if used in incorrect games. This checkbox will enable HW hacks that can be configured further using Configure button. 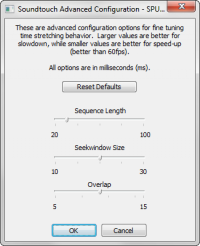 MSAA: This option is used to activate multisample anti-aliasing mode. It may dramatically improve the quality of visuals but requires some additional processing power from your video card. Additionally it is highly video card memory demanding and may crash PCSX2 if the card runs out of RAM. You can set the option to 2,4,8 or 16. The plugin will automatically choose and use only the supported mode. For more information read the description at the right panel. Skipdraw: Skips drawing some surfaces based on how likely they are to cause issues. This option may help with removing ghost images or other post-processing effect rendered incorrectly. You should specify how many surfaces need to be skipped after the first problematic one is found. Always try lower values (like 1-3) first before using higher ones. The side effect is the increased possibility for broken/missing graphics and effects. This hack may cause random performance boosts as well. Alpha: Try this if your game has issues with fog like effects or shadows. Half-pixel Offset: This hack adds an 0.5 pixel offset to all surfaces so some common up-scaling issues may be fixed. You can try it when blur or halo effects seem to appear shifted to the upper-left corner from where they should be. Sprite: Gets rid of black inner lines in 2D sprites. Grayed option is recommended. WildArmsOffset: Lowers GS precision to avoid gaps in pixels when upscaling. It's known to help with upscaling problems for some 2D games. Read the description at the right panel for more information. Aggressive-CRC: Can remove effects in some games to make image clearer. Read the description at the right panel for more information. Alpha Stencil: This setting will disable partial transparency or prevent drawing some elements. May improve drawing shadows. Read the description at the right panel for more information. Nvidia Hack: Fixes odd stretching issues in certain NVIDIA drivers when upscaling (using DirectX 11). Try not to use this unless your game Videos or 2D screens are stretching outside the frame. 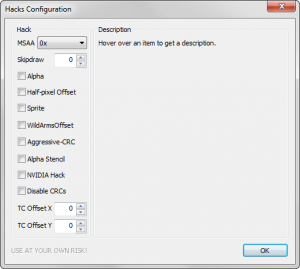 Disable CRCs: The option will disable all the GSdx hacks. This will break many games; but for certain games like Shadow of the Colossus, you might like the result better. TC Offset X/Y: These settings can help fixing some misaligned textures when using upscaling. They will correct textures in some games, including Persona 3, Haunting Ground and Xenosaga. Software Mode Settings This set of options will work only if you have selected Software Renderer. You can tune some settings for extra performance or video quality here. The options will not get grayed out even when you select hardware renderer so that you are able to configure both hardware and software mode. Some games may require switching between these modes (F9) so you might need to prepare everything beforehand. Extra Rendering threads: This option determines how many threads GSdx will use while rendering to take advantage of all the vacant cores your CPU might have (note that it will only be useable for software rendering). For example set it to 3 for quad core processors (1 for PCSX2 and 3 for GSdx software rendering). This may boost speed significantly in multi-core systems. Edge anti-aliasing (AA1): This may improve the resulting visuals by applying an anti-aliasing algorithm (required by emulation in some games) but will also reduce performance. This is an experimental option so it must be used with some caution. Movie Capture This feature will only work while you are ingame. By pressing F12 a message box for video capture will appear. You'll need to specify the place where to store video, processing codec (like for ex. x264vfw, note you'll be only able to use already installed codecs) and picture resolution. Please be aware that lossless or uncompressed video may produce VERY large files so your HDD must have enough free space to contain it. Press F12 the second time to stop capturing. The result video will be automatically speed up to 100% even if you have experienced slowdowns while playing. If you use SPU2-X as your audio plugin the audio file recording.wav will be also recorded and saved alongside with the video file. You can find some additional information on GSdx plugin here. ZeroGS is a DirectX 9 plugin developed by ZeroFrog. It is aimed for graphics cards supporting pixel shaders 2.0 or higher (if you select ZeroGS and your card does not have pixel shaders 2.0 you will get a "Error opening gs plugin" message and PCSX2 will close). Interlace Enable: This option will try to resolve some undesired interlacing effects (like screen "shaking"). Those games do not have interlacing issues will look better with this option disabled. You can toggle it while ingame by using F5 key. Bilinear Filtering: This option will filter the textures when rendering them. Filtering may decrease your FPS unless you have a good graphics card. You can toggle it while ingame by pressing Shift+F5. ZeroGS supports two bilinear filtering modes: normal bf and forced bf. For some games that will specifically ask for nearest-neighbor interpolation (no filtering mode) ZeroGS will disable filtering in normal bf mode. In forced bf mode, on the other hand, bilinear interpolation (filtering) will be forced in any game. It should be noted that forced bf mode can introduce unwanted artifacts at the edges of textures in some games, however, in most cases, it will produce smoother looking picture. Wireframe rendering: This mode will only render lines between vertices of 3D objects making them look like wire-frame models. You can toggle it while ingame by pressing F7. Capture avi: This option will allow to capture video output in a file (see also Movie Capture for GSdx plugin). Press F12 while in game and you will be asked to select a codec. Currently you can only select XviD as a codec (the plugin will crash with any other choice). Press F12 the second time to finish capturing. The plugin saves file zerogs.avi in your PCSX2 folder. Save snapshots as BMPs (default is JPG): ZeroGS captures screenshots and save them in snaps when you press F8 ingame. By default screenshots are saved in JPG format. This option allows you changing the format to BMP to make the pictures lossless (note that they will require mode disk space). Fullscreen: This option will instruct the plugin to perform the output in fullscreen mode instead of default windowed mode. You can use Alt-Enter combination to enter fullscreen mode while ingame. Widescreen: This option will force ZeroGS to render in 16:9 resolution. Some games support wide screen mode natively, some require patching to make them work in widescreen mode and some will not support it at all. Look up to your specific game card to find more information. Default Window Size: This will specify the default size of ZeroGS window. The size of GS window will not affect ZeroGS performance. While in game pressing Shift+F7 will toggle on and off the Frames Per Second (FPS) indicator. These additional options can be used to tweak ZeroGS some more. Some games may benefit greatly from this set of options while others can be broken. If a particular set of options works very well for a particular game, then these options can be saved in the game's patch file which will be applied every time the game is loaded. This is useful when you want these options to be enabled only for that particular game and not to for other games. Each set of options in ZeroGS has a unique ID-number. To find this number click on the Compute OR IDS button in ZeroGS configuration dialog box. Insert the generated number into the game's corresponding pnach file (usually game CRC.pnach) in a form zerogs=xxxxxxxx (where xxxxxxxx' is the mentioned number). This plugin will not render anything on screen. Its configuration consists only of enable logging checkbox useful solely for debugging purposes. This is arguably the most advanced PAD plugin for PCSX2. 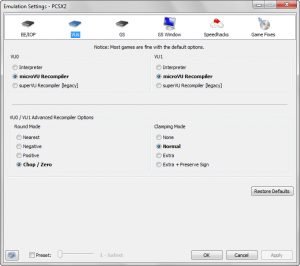 Use configure button to open LilyPad configuration dialog. You'll see a configuration dialog (pictured, click to enlarge). LilyPad supports keyboards, mouse, game pads and XBOX 360 pads. It also has some very handy hacks like ESC hack or Disable Screensaver option. LilyPad downside is that you will need to configure the plugin fully at least once before playing any game and it may take quite some time if you are not familiar with it. For a very detailed description about what each setting does and how to properly configure it visit LilyPad article and/or the official thread of the plugin. This plugin is much easier to handle for the new users whilst it still allows for a great options flexibility (and some of its options are not implemented in LilyPad) Use configure button to open Pokopom configuration dialog. Pokopom is a relatively new input plugin developed by KrossX. Some of the unique features include pressure sensitivity support, rumble with a custom curve and more. For a very detailed description about what each setting does and how to properly configure the plugin, visit the official thread of the plugin and/or check the small Pokopom Wiki. This plugin is the oldest of the three and does not require much fiddling but somewhat lacks in the options department. But there are still some very picky games that refuse to work with any other plugin except for SSSPSX (for instance Warriors of Might and Magic). Use configure button to open SSSPSX configuration dialog. The dialog will allow you to configure keyboard keys to emulate PS2 controller input. If you want to clear a key assignment you can click on the respective button and wait until the Timeout timer reaches zero. The plugin can emulate up to two DualShock2 controllers (use dialog tabs to switch between them). 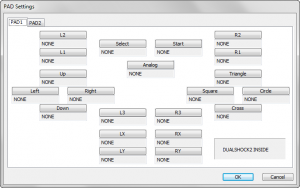 SSSPSX Pad supports analog input emulation. Use LX, LY, RX, RY buttons to assign keys to analog axis. LX is for Left analog X-Axis, LY is for Left analog Y-Axis, RX is for Right analog X-Axis and RY is for Right analog Y-Axis. R3 and L3 emulate buttons on the analog stick of the PS2 controller. 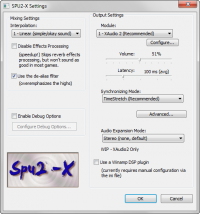 SPU2-X is the most advanced, compatible and up-to-date sound plugin for PCSX2. It was first based on Gigaherz's SPU2ghz and later modified by Jake Stine (Air). This is the only SPU2 plugin that supports audio processing effects (like reverberation and Dolby Pro Logic (if your sound card is able to decode it)). Many games only work correctly with SPU2-X. Nearest: This option will disable sound interpolation. It is the fastest option but the sound may not be that good in quality. Linear: SPU2-X will use linear interpolation. This method is fast and the quality is acceptable. Cubic: SPU2-X will use cubic interpolation (slower and better in quality). Hermite: SPU2-X will use Hermite interpolation (slower and better in quality). Catmull-Rom: SPU2-X will use cubic Hermite (a.k.a Catmull-Rom) interpolation (slower and better in quality). 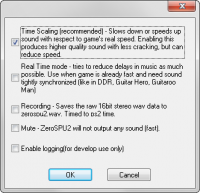 Disable effects processing: This option will disable any special effects requested by games (like for example reverberation), This may speed up the emulation but some games may not sound as good as they should be. Use the de-alias filter: Gives more emphasis to the highs. No sound: SPU2-X will not produce any sound. The fastest option suitable mostly for debugging. XAudio 2: Recommended for Windows users. DirectSound: Recommended for Windows users if XAudio 2 option does not work. WaveOut: Not recommended, but may be an alternative if nothing else works. Portaudio: SPU2-X will use a cross-platform library called Portaudio. This is the only option for Linux users. Device name: the option is used to select the specific audio device you want to output sound to. WASAPI Exclusive mode: This will allow SPU2-X to work in exclusive mode, blocking all other applications from using your output device. Output Latency: The lower the latency value the smaller audio delay you will experience. You can leave this to Use smallest possible to let the plugin decide what's best for you, or set a custom value below. Note that setting latency too low WILL cause clicks and pops in sound, so change the values until you find the lowest one that works with your game without causing issues. TimeStretch: The default and recommended setting. The options will keep audio and video in sync and it may also help to eliminate clicks and other sound problems. Note that if you cannot achieve 100% speed in game, the sound will also slow down to match your emulation pace. Async Mix: This option will let the audio samples play on their own making it possible for the audio to go out of sync with the video if your emulation is slow enough. You will hear normal sound even if your frame rate is not optimal. This option can cause hangs or crashes in some games so use with caution! None: SPU2-X will skip the sample whenever the emulation will start lagging behind. This may break the sound experience on slow machines but you may gain a small speed boost. Advanced: These options are only useful in TimeStretch mode and let you configure some of its parameters. Fine tuning stretching behavior may improve a perceived sound quality. Try to increase the values in case your speed is not optimal and decrease the values in case you're playing with speed higher than normal. Pressing Reset to Defaults will set all values back to their initial numbers. Audio Expansion Mode: This option will help you to expand the ingame sound to your specific speakers or headphones configuration. This option is only supported in XAudio 2 mode (see module). Stereo: Default setting. Stereo sound. Use a Winamp DSP plugin: This option will allow you to use Winamp DPS plugins to alter the resulting sound. It will require you to set plugin's path in ini-file (see [DSP PLUGIN] section in SPU2-X.ini file in inis sub-folder of your PCSX2 folder). Enable debug options: This option is only useful for developers (it will allow for extensive logging and dumps). Time Scaling: This option will use time stretching akin to TimeStretch mode of SPU2-X. The time-scaling feature works best under Windows, but is also implemented in Linux. Real time mode: This is a tighter time stretching mode for games that need additional accuracy and lower latency. Audio/video recording: This option will let you record sound in zerospu2.wav each time you start playing a game. Mute: This option will mute sound giving a bit of extra speed. In most cases you will only need to use the PCSX2 built-in ISO loader (ISO option in the CDVD menu, then use ISO Selector to select actual game image from the image history list or choose Browse... to select the image from disk. However, if you want to play a game from the actual DVD disk or to create a dump of an ISO file use Plugin option in the CDVD menu. It will let you use one of the PCSX2 CDVD plugins instead of ISO loader. Configuration allows you to select your DVD-ROM drive letter. This option will allow you to play directly from your PS2 DVD without dumping it to an ISO image. Put your PS2 DVD disk in the selected drive before starting emulation. This is the only plugin that at least partially supports disk changing. Some games may wait for the next disk to advance; this plugin is the only choice for such games! The unique feature of this plugin is that it allows you to compress and to use compressed ISO images in order to save your HDD space. It can also decompress compressed earlier ISO images. To compress, decompress or use an already existing ISO image click Select ISO button. Once you've selected an image you can compress or decompress it by using the corresponding button. The selected image will also be used automatically when you start emulation. Note that plugin has two compression modes: .Z (faster compression, bigger result size) and .BZ (slower compression, smaller result size). The Enable Block Dump=>ISO name.dump checkbox is used manly for debugging purposes. When checked, the plugin creates ISO name.dump file in the PCSX2 folder. This file will contain every sector read during the emulation of the game. You can select this file using Select ISO button afterwards and run like any other ISO image but if the game will attempt to read a sector that was not included in the file, you will experience a hang or the emulator will crash. This is a null plugin, meaning it simply does nothing. Dev9 is a collective name for plugins that handle HDD and ethernet (LAN/Internet) access. By default PCSX2 installation has only one plugin Dev9null v0.5.0, which is null plugin used as a stub. However there is a newer Dev9 plugin in development by Luigi__ named MegaDev9. The plugin is still in its early development stage at this time (early 2015) but it can already partially emulate HDD. You can get it from here. Also there is an experimental Ethernet plugin from gigaherz and drkIIRaziel named DEV9giga-razi. Even with the most of Sony game servers down you can still give it a try. It can be downloaded using this link. Make sure you follow the how to play online guide. As with Dev9 plugins PCSX2 does not currently have any official working plugin to properly emulate USB access. The release package includes only USB Null v0.7.0 which is yet another stub plugin. However there is a USB plugin called Nuvee that supports USB mice, keyboards and lightguns by Shalma. You can get it from here. Additionally, there is a new plugin by jackun called USBqemu wheel mod emulating steering wheels. The plugin is a modification of an old USB Qemu plugin. USBqemu is fully capable of supporting various steering wheels. For more information visit the plugin's dedicated thread on the forums and/or you can download it using this link. At this moment, there are no official or unofficial working Firewire plugins for PCSX2. The included plugin FWnull v0.7.0 is a stub akin to Dev9 and USB plugin stubs. Obtaining PS2 games can be as easy as buying PS2 DVDs off eBay. However, an original game DVD is not enough to make PCSX2 work. You'll also need the BIOS dumped from your PS2. Unlike the PS2 PCSX2 does not implement region locking so if you have a PAL BIOS in your PS2 you can still play NTSC games, and vice versa. The BIOS tab of the Plugin/BIOS selector window will allow you to select a BIOS image from the list of BIOSes available to you or to specify the folder where these images are stored. Note that the only legal way of obtaining a BIOS image is to dump it from your own PlayStation®2 console. Do not attempt to ask where to get BIOS images on the PCSX2 forums, because it's against the forum rules. The PS2 BIOS is copyrighted material of Sony Corporation. It is illegal to distribute the copyrighted files without copyright holder consent. PCSX2 team could get in trouble if suspected of illegally supplying people with BIOS files! If your BIOS image does not appear in the BIOS images list and you are sure that you have selected the correct folder, you may what to try dumping your BIOS again because the one you have is probably not valid or corrupted. Note that it is not recommended to use the first Japan version of BIOS (SCPH-10000.bin). You will probably be able to run the games with it but there is a chance to affect compatibility somehow. Although the first PS2 consoles should be really hard to get these days. Interesting fact: For maximum compatibility it is recommended that you use a BIOS image different than SCPH10000.BIN which is the oldest one. That's because with this BIOS there are problems in memory card emulation and in other sections. auMatt. The dumping of BIOS is a complicated process so follow the instructions you can get from this thread. You can start dumping by downloading the tool from this page or refer to the official guide here. Also, here is a youtube tutorial on dumping your BIOS (by FullGrownGaming). Apart from the main BIOS file (SCPH-XXXX.bin must be exactly 4Mb of size) your BIOS files collection may include rom1.bin,rom2.bin,erom.bin and SCPH-XXXXX.nvm files (note that XXXXX is the version of your BIOS, e.g. SCPH-34004.nvm and SCPH-34004.bin). The last file contains some PS2 common and regional settings and it can also be created by the PCSX2 itself after you configure your BIOS while in emulation mode (set time zone, language, etc.) but it would still be fine to dump this file directly from your console. Interesting fact 2: Basically the first Japaneese PS2 had a single BIOS and the DVD player etc were installed on the memcard. The PS2's after that first model had the DVD Player software installed in a separate ROM (EROM) which is encrypted. The ROM1 is an additional part of the BIOS that contains some extra stuff like ID's for DVD Player version etc. ROM2 is the same really but I think only available in Chinese PS2's. auMatt. This page will allow you to select different folders to store savestates, snapshots or system logs. Uncheck the Use default setting checkbox to be able to choose the required folder. 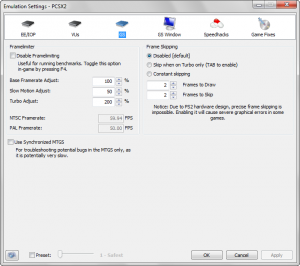 Emulation Settings config window is the collection of main PCSX2 settings to tune the behavior of PCSX2 itself (not unlike the plugins separate configurations can tune the behavior of a particular plugin). You can access the window from Config => Emulation settings menu. There are 6 tabs, EE/IOP, VUs, GS, GS Window, Speedhacks and Gamefixes each of which has its own set of settings. EE/IOP tab stands for Emotion Engine / Input Output Processor which are the core components of the PlayStation®2. The tab contains 4 settings. Emotion Engine: Enables or disables recompiler (i.e. the program that translates the native PS2 code into the native x86 code, instead of slowly interpret each PS2 command) for PS2 Emotion Engine (EE) processor emulation. Interpreter mode disables the recompiler making the emulation painfully slow. Recompiler mode is extremely compatible, so the interpreter mode shouldn't be used for anything but debugging purposes. Enable EE Cache: Used only with interpreter mode, and only known to help the Japanese version of Dead or Alive 2. IOP: Enables or disables recompiler for PS2 Input Output processor (IOP). You should also leave this option enabled. Round mode: Changes the rounding method for float numbers. Intel/AMD x86 CPUs and PS2 CPUs use somewhat different floating numbers implementations. Recompiled program running in the native x86 code may sometimes calculate slightly different numbers. As insignificant as it may sound this difference can really break games to the point of crashing and black screens. Unfortunately there is no real way to fully implement PS2 CPUs behavior when it comes to floating point arithmetic so PCSX2 will allow you to use a collection of different approximations known to work better for some games while breaking the others. If your game is freezing, try changing this value. Default and the most compatible setting is Chop/Zero. This default value will be changed automatically for some games known to need a different value when Automatic Gamefixes mode is enabled (see System main menu). Clamping mode: Changes the implementation of emulation of INF and NaN numbers. Same as with rounding FP numbers the implementations of INF (infinity) and NaN (not a number -- reserved byte combinations could not be translated in any real FP number) in PS2 CPUs are different from x86 CPUs. And same as with FP numbers this obstacle cannot be gracefully overcome. 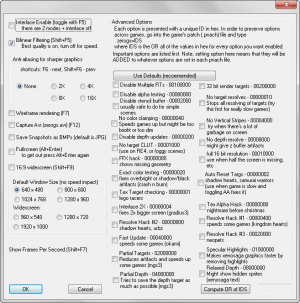 This setting will allow you to choose one of four approximations of PS2 CPUs INF/NaN behavior, each of which is more compatible than the previous one in the cost of emulation speed (being more compatible in this case will require additional checks and code tricks each time FP number is calculated). These modes go from faster to slower. None is the fastest but the least compatible mode and Full is the slowest but the most compatible mode. By default the value is Normal which will work fine for most games without compromising the speed much. This default value will be changed automatically for games known to need a different value when Automatic Gamefixes mode is enabled (see System main menu). Restore Defaults: This button will restore all settings to their default values (which are seen as in bold or green font). VUs stand for Vector Units which are the PlayStation®2 co-processors working in parallel with the EE and IOP CPUs. The PlayStation®2 has two VUs called VU0 and VU1. You can change VUs compilation modes independently for VU0 and VU1 (although it makes sense to set them to the same value). As with EE and IOP CPUs there is an old and very slow interpreter mode which is useful only for debugging. VUs however have two different recomplilers -- microVU (more compatible default recompiler) and superVU (legacy less compatible recompiler used mainly for debugging, but it can be slightly faster). It is recommended to leave both settings at their default microVU Recompiler value. VU0/VU1 Advanced recompiler options let you select Round mode and Clamping mode for floating point numbers emulation much like with EE and IOP CPUs modes (see above). Restore Defaults button will restore all settings to their default values (which are seen in bold or green font). If you experience spikey polygons (SPS) or bad geometry, try setting Clamping mode to Extra + Preserve Sign. GS stands for Graphics Synthesizer PlayStation®2 co-processor responsible for rendering the graphics (but is also used by some games for additional calculations and other purposes). The PCSX2 will work in conjunction with the selected GS plugin (like for ex. GSdx plugin) to emulate PS2 graphical co-processor and convert its output into input understood by the PC video cards. Framelimiter: The options in this group can be used to control the frame rate of your games in various ways. Disable Framelimiting: With this option enabled the frame rate will only be limited by the power of your PC. It will not however increase the game performance in case the game runs slow. This option may be useful when you want to skip some repetitious sections of the game. You can toggle it while playing by pressing F4. Base Framerate Adjust: This option will allow you to adjust the base framerate for your games by a percentage. The emulator will limit the game frame rate by the base NTSC (59.94 FPS) or PAL (50 FPS) constants. Frame rate will be increased or decreased according to this value. Again, this option will not speed up the slow game it may only limit the frame rate of a game performing faster than needed on your PC. Slow Motion Adjust and Turbo Adjust: PCSX2 has two additional frame rate modes that you can freely switch to while playing a game. Slow Motion mode can be switched (on and off) by using Shift-Tab and Turbo mode be switched by just using Tab key. NTSC Framerate and PAL Framerate: These boxes indicate the base frame rate to limit the speed of NTSC or PAL games. The default values are 59.94 FPS and 50 FPS respectively. These values can be changed only by editing the pcsx2_vm.ini (in inis folder of PCSX2, see FramerateNTSC and FrameratePAL variables). It is not recommended to change them because it will break a number of games (but note that decreasing the values can speed up a few games). Constant Skipping: This allows the frame skipping to be enabled by default. Frames to Draw and Frames to Skip: These boxes allow to adjust the frame skipping mechanism to your liking. You can specify how many frames will be drawn before skipping (Frames to Draw) and how many frames will be skipped prior to start drawing again (Frames to Skip). Default values are 2 and 2. To enable frame skipping while playing press Shift + F4. Press this combination again to disable it. Use Synchronized MTGS: This will enable a different MTGS mode. The mode is very slow and useful for debugging purposes only. Aspect Ratio: You can select the window aspect ratio (shape) here. If you have a widescreen (16:9) monitor you may want to remove the left and right black bars to get a better experience. Unfortunately many games do not natively support wide screen aspect ratio and selecting it here will cause the image to stretch which may not be a desirable side effect. Some games however may be helped to support 16:9 resolution by special widescreen patches made by the community. If the game neither have the native 16:9 support nor the patch to overcome this your only options are to play it with 4:3 aspect ratio with black bars or bear with image stretching whichever option is the best for you. You can choose Standard (4:3), Widescreen (16:9) or Fit to Window/Screen here. In the latter case image will always be stretched. Custom window size: This option lets your define the GS window size in pixels. Note that this does not affect the game's rendered resolution, image quality or speed in any way. Your game sessions will always start with the window size you have selected here. Zoom: This option will zoom in or out the rendering image (around the central point). It may help in certain situations (decrease black bars for instance by zooming them out of the view). You can also use this feature while in game by pressing Ctrl and numpad + to zoom in, Ctrl and numpad - to zoom out and Ctrl and numpad * to reset zoom too 100%. There is also a hidden key combination to stretch GS window while in game only vertically. Use Ctrl + Alt and numpad +, numpad - and numpad * to increase, decrease or reset vertical stretch. This option may be useful when you need to remove vertical top and bottom black bars but remember that the image itself will get stretched and will lose original proportions. 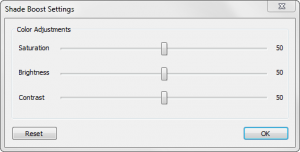 Disable window resize border: This option will remove the black bars used as resizing padding from the GS window. Always hide mouse cursor: This option will disable drawing the mouse cursor anywhere within GS window. This may be helpful if the mouse is used for aiming in game. Hide window when paused: With this option enabled, the GS window will be hidden whenever emulation is paused. 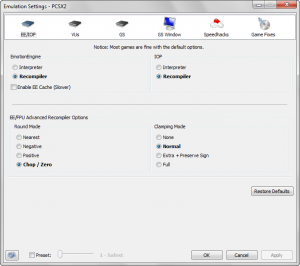 Default to fullscreen mode on open: This will instruct PCSX2 to start emulation in fullscreen mode. Switch back to windowed mode by pressing Alt + Enter. Wait for vsync on refresh: When checked, PCSX2 will use vertical synchronization when drawing frames. Vsync can reduce image tearing but will also greatly reduce actual FPS. This option will only apply to fullscreen mode and may not work with all GS plugins. Speed hacks are various techniques used to speed up emulation at the cost of emulating accuracy. All of these options can cause severe bugs, crashes and other abnormal behavior so use them with caution! Some games may benefit from these settings immensely while others can be slowed down or broken. Read the on-screen hints and messages to get more information (especially if you're new to this) they will help you not to break anything. If your system is powerful enough to emulate your game in full speed you do not need to enable anything here because none of these options can improve compatibility. Enable speedhacks: You can disable all speed hacks in one click by unchecking this box. This may be useful if your game is unstable and you are narrowing down the possible cause of this. Emotion Engine (EE) Cyclerate: This hack will increase the time required for one EE operation to complete (essentially down-clocking Emotion Engine). Your CPU will get additional cycles to spend on emulation of other PS2 processors. This will speed up those game that do not utilize EE processor fully (VUs and GS will get additional CPU power). In contrast, the games that use EE fully will appear slowed and may start skipping frames. Slider Level 1 (default): This will emulate the EE on its actual speed. Slider Level 2: Reduces the EE cycle rate by 33%. Moderate speed increase for many games and small compatibility hit. Slider Level 3: Reduces the EE cycle rate by 50%. Big speed increase for some games and moderate compatibility hit. This setting can also cause stuttering audio in game videos. VU Cycle Stealing: This hack specifies the number of cycles the Vector Units steal from the Emotion Engine. This option is somewhat resembling the previous although the donated CPU power will go directly to two VUs (not GS emulation or other PCSX2 needs). As VUs tend to need more power than EE, the hack will exploit this fact by overclocking VUs in the cost of EE clock speed reduction. Please note that it can cause false FPS readings (especially in higher values), screen flashing, slowdowns and possibly more serious bugs for some games! Using the slider control you can select up to four levels of VU stealing starting with level 0 (no VU stealing) to level 3 (severely incompatible option that will cause flickering, slowdowns and graphical bugs for the majority of games). Level 1 is fairly compatible while level 2 is selectively compatible and should be used with a caution. Enable INTC Spin detection: This hack exploits the vsync technique used by some (mostly 2D) games. Vsync signal will be set immediately skipping the games' waiting cycle. The hack is set by default and is very compatible. 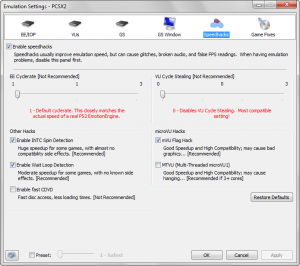 Enable Wait Loop detection: PCSX2 will detect some idle cycles with this hack enabled. Some games used those cycles for various reasons (from synchronization or to slowing down if the real PS2 speed was too high). If detected a cycle than will execute only once reducing the waiting time and moderately increasing emulation speed of some games. The hack is set by default and is very compatible. Enable fast CDVD: Reduces loading times by setting a faster disc access mode. Check the HDLoader compatibility list for games that will NOT work with this (usually marked as needing mode 1 or slow DVD). Not recommended since it can break many games. microVU Hacks: These hacks are only applied when microVU is selected as the VUs recompiler. If superVU is selected, these hacks do not apply. mVU Flag Hack: This hack will skip some VUs flag updates by detecting the program blocks that will not read VUs flags, saving CPU time. SuperVU recompiler is said to have this hack built-in by default. The hack is set by default and is very compatible (but still may cause bad graphics in case the detection algorithm fails). MTVU (Multi-Threaded microVU1): This option will isolate VU1 emulation to a separate CPU thread, making it a huge speed up for CPUs with 3 or more cores. The option is highly compatible (except for some possible synchronization errors or timing issues that may cause problems in a handful of games). If you have a dual core CPU you may still want to try this option (there are some reports of speed increase even on these CPUs). Restore defaults: Click this to restore all settings to their default values. This tab contains some game-specific hacks and fixes. These fixes are disabled by default but enabled automatically if the game in question is detected to be running. The Automatic Gamefixes option can be also switched off (although it is not recommended) in System sub-menu of PCSX2 main menu. You should not enable these hacks unless you have a game that somehow was not detected by PCSX2 automatically (note also that some of these fixes are not applied automatically). The game-specific fixes are temporal solutions to some unresolved emulation issues. PCSX2 developers provided them to increase compatibility levels so some games, otherwise broken, can still be enjoyed. As the emulation compatibility will continue to improve some of these options may become obsolete and will be removed. Most of these hacks are needed because the PS2 has different float arithmetic than x86 CPUs. Some of these differences do not lead to any problems, others however may cause serious issues in certain games. You can read hacks descriptions and hints to get more information. VU Add hack: Enable it only for Star Ocean: Till the End of Time,Valkyrie Profile 2: Silmeria and Radiata Stories. VU Clip Flag Hack: This hack is only needed when superVU is selected as VUs recompiler. Needed for Persona games. FPU Compare Hack: Enable it only for Digimon Rumble Arena 2. FPU Multiply Hack: Needed only for Tales of Destiny. FPU Negative Div Hack: Needed for Gundam games, fixes the camera view. VU XGkick Hack: Adds more delay to VU XGkick instructions. Needed for Elemental Gerad. FFX videos fix: Fixes gray overlay garbage in the videos of Final Fantasy X.
EE timing Hack: Known to help Digital Devil Saga, SSX, Resident Evil: Dead Aim. Skip MPEG Hack: Use this to skip freezing intro videos to avoid hanging. OPH flag Hack: Needed for Bleach: Blade Battlers, Growlancers II and III and Wizardry. Ignore DMAC writes when it's busy: Needed for Mana Khemia: Alchemists of Al-Revis and Metal Saga. Delay VIF1 stalls (VIF1 FIFO): Fixes SOCOM II: U.S. Navy SEALs HUD. Ignore Bus Direction on Path 3 Transfer: Fixes Hot Wheels. Switch to GSdx software rendering when an FMV plays: This will allow GSdx to automatically switch to a software renderer when FMV starts to play and back to hardware renderer when the video is finished. This option is very useful considering the number of games that have issues with videos in GSdx hardware mode. Preload TLB hack to avoid TLB miss on Goemon: Helps to fix Bouken Jidai Katsugeki Goemon TLB miss issue. For those users do not want to spend the time fiddling with all the hacks, fixes and speed-ups described above and especially for the new users who wants to start playing games right away the system of options sets or presets was introduced. This system will restrict you to only 6 slider positions instead of myriad options and PCSX2 will automatically assume using specific options, game fixes and speed-ups according to the presets level you choose. Check Preset checkbox on the botton of settings window to enable using presets. This will disable most of the options on many tabs (because they will now be controlled by PCSX2 automatically). Presets go from the safest (but also the slowest) to the most unsafe (but the fastest one). You should start with level 1 or 2 if you have a powerful machine. Level 3 and 4 are for those who do not have a good machine or have a very demanding game to emulate. Level 5 or 6 are not recommended and should only be used as a last resort (note that some game can even be slowed down by those levels). PCSX2 main menu consists of 5 sub-menus. System menu contains system-wide switches and options. Boot CDVD (full): This item will allow you to load and start your game from the source configured in your chosen CDVD plugin. 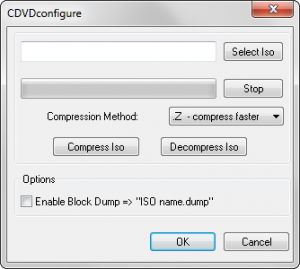 If you did not configure any CDVD plugin the emulator will start the previously used ISO image or will ask you to select one if this is the first time you use ISO loader. This particular option will load BIOS first which in turn will load the game itself. Loading BIOS will take time but some games may use language configured in BIOS thus allowing you to play in your language (ex. Jak 3). Some game may need BIOS to initialize internal variables, and may refuse to start otherwise (Amplitude or Lara Croft Tomb Raider: The Angel of Darkness). Most of the games however does not necessarily need to be started from BIOS in order to function properly. And there are games that will refuse to start correctly through BIOS (ex. Burnout Dominator). Boot CDVD (fast): This item will not load BIOS before starting your game. It is safe to choose this option for the majority of games. Run ELF...: This item will let you load a single executable ELF-file. Most PS2 home-brew demos are in ELF-format. However the mode is not suitable to run commercial games. Pause/Resume: This item will be enabled until you start a game. You can pause and resume the game any time during your game session. Load State: This item will allow you to select and load a savestate from one of the 10 save slots. Additionally there is a backup state which will contain the last overwritten savestate (so you have a last chance to restore your save when you accidentally overwrite it or the written state appeared to be corrupted). This item will only be active when you're ingame. Save State: You can save a game state in one of the 10 save slots. This item will only be active when you're ingame. Backup before save: Unchecking this option will disable the backup savestate (see Load State description). Automatic Gamefixes: This item will enable or disable automatic application of game fixes. See game fixes for more info. Enable Cheats: This item will enable or disable automatic application of game cheats. Cheats are pnach files located in PCSX2 cheats folder. These files have multiple purposes from making your game playable (if nothing else helps) to circumventing some in game restrictions (adding more money or making your ingame character immortal, see game cheats and memory editing for further information). You can find the big library of cheats on the forums in this thread. Enable Widescreen patches: This item will enable the additional folder cheats_ws to load pnach files from. You should use it to store widescreen patches for your games. See some information about it here. You can find the big library of patches on the forums in this thread. Enable Host Filesystem: This item will enable or disable the file system extension that may be used by home-brew developers to load files from your (host) machine. See some more information (or alternatively) if you're interested. Shutdown: This item will shut down the current game you are playing and reset PCSX2 (it will not close PCSX2 itself). Exit: This item will close the emulator. 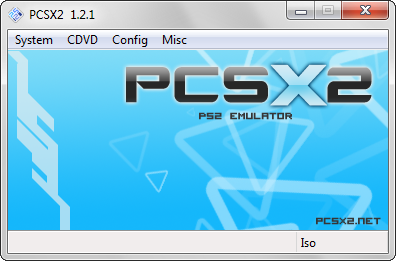 CDVD menu contains options for PCSX2 internal ISO loader. ISO Selector: This item will allow you to select one of the recent ISO images or add new ISO image to the list by using browse.. item. The image you selected here can be booted in system menu (see description above). Plugin Menu: This item will let you quickly choose CDVD plugin and access its configuration (rather than going through plugins configuration). The menu will only be accessible if you choose Plugin item in CDVD menu menu (i.e. if you prefer to boot your game using plugins instead of internal ISO loader). ISO, Plugin and No Disc items: You can only select one of the three options. Choose ISO if you want an internal ISO loader to boot your ISO image (you cannot play off the real DVD disk this way), choose Plugin if you prefer to use a plugin for this task (remember that plugin needs to be configured before use, see CDVD plugin). No Disc option will allow you to run only BIOS (as if you started PS2 console without inserting any DVD). You can configure your language in BIOS options before playing some games that may use BIOS to determine your language preferences. Emulation Settings: Please refer to Emulation Settings. You can specify a custom folder for memory cards using browse button. Open in Explorer will open the selected folder in Windows Explorer (to access its contents). Selecting a memcard from the list will allow you to Duplicate, Rename or Delete it. Eject button is available when you select one of the two active memcards. Ejecting memcard will not delete its contents it will only make the card inactive disallow PS2 games to use it in any way. To insert card in one of two available virtual card slots, select a disabled card, press Insert button and choose a virtual port to insert your card to (any memcard already in this port will be automatically ejected and disabled). To create a new card you can select [-- Unused cards --] slot and press Create button. You will need to specify your new card's name and size (8Mb is a recommended option because some older games will not be able to use large memory cards). Use NTFS file compression will create a file with NTFS compress flag (it will save some of your HDD space but considering the midget card size by today's standards it will not make any noticeable difference). Auto-Eject Memcards when loading save states option will momentarily eject and reinsert both selected memcards every time you load savestate while playing. This will avoid such problems as memcard corruptions if the game tightly synchronizing some internal variables with memcard's contents. Ejecting it will force the game to re-index the card contents avoiding possible desynchronization. Some games however (ex. Guitar Hero) do not like this technique. You'll have to uncheck this option in case you encounter savestates loading problems. Plugin/BIOS selector: Please refer to this part of the guide for more information on this menu item. It will allow you to configure all plugins in one dialog, but if you rather want to reconfigure a certain plugin you may prefer to use the next sub-menus -- Video (GS), Audio (SPU2), Controllers (PAD), Dev9, USB or Firewire. They will allow you to quickly select (or configure) for example PAD plugin or select ZeroGS instead of GSdx when game demands it. Multitap 1 and Multitap 2: These items will allow you to use up to 8 controllers through the multitap support (up to 4 for one PAD port). Prior to enabling these options however you will have to configure multitap in the Lilypad plugin. Multitap support does not work with all games yet, but most games are compatible with it. Clear all Settings: This item will delete all configured settings in all plugins, all core settings will be reset to their default values and the First Time Configuration Wizard will be open. Use this option as a last resort if your game started behaving abnormally and you are unable to find and reverse your misconfiguration. Otherwise stand clear of it because it may cost you a lot of time which you spent on PCSX2 configuration. Fortunately, it will show the confirmation dialog before proceeding. Misc menu contains some miscellaneous options including GUI language option. Show Console item will show and hide PCSX2 debugging log window (also known as Console Window). You can use portions of information in this window when submitting a possible bug. If you are an advanced PCSX2 user you can also use some log messages to determine reasons behind hangs and slow-downs. The window may be further configured by its own menu (you can choose what to log, change its appearance and save the log to a text file). About item shows the list of PCSX2 authors (developers). Change language item allows you to change GUI language. Debug menu: This item will only appear in case you're using debug build. It will allow developers to use built-in debugger to trace code and see the contents of emulated PS2 registers and memory. It has little to no use for the ordinary users. For a full list of currently supported keyboard shortcuts, you can refer to this article or check page 4 of the PCSX2 readme. PCSX2 also supports overriding the hotkeys set by using a custom made ini file (PCSX2_keys.ini). For instructions on how to create it please also refer to this article. This guide is based on the original Official English PCSX2 configuration guide v1.2.1 written by Bositman. Thanks to Gigaherz for pointing out how to make the index guide work with Firefox. Many thanks to Regulus for the background and the smilies script and for his help. Thanks to Razor Blade for fixing the image borders. Thanks to crushtest for pointing out some problems with Firefox and for his suggestions. Thanks to Nachbrenner for his suggestions and additions. Thanks to Falcon4ever for bugging me with XHTML validation. Thanks to rama for helping me with some explanations. To report a found bug to the developers read the following forum post. You're going to find the instructions on how to properly report bugs in it. More on PCSX2 command-line support can be found here. Information about compiling and development can be found here. A collection of older official guides can be found on the official forum. The official video configuration guide (for PCSX v1.0.0) can be found here. The translations of the official PCSX2 configuration guide v1.2.1 on different languages can be found here. The shorter version of the official PCSX2 configuration guide v1.2.1 made by avih can be found here. This page was last edited on 22 January 2018, at 21:02.